Local traffic: Local traffic will be able to use fully paved streets and walkways on all areas except the four blocks under construction. Access to businesses and residences will remain available in the four block segment under construction, though surfaces may not be paved or smooth at all times. 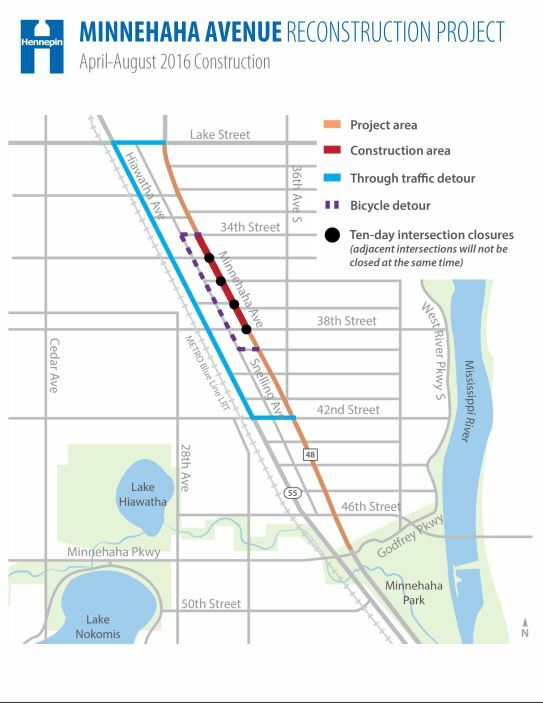 Crossing Minnehaha Avenue: Travelers will be able to cross Minnehaha Avenue at intersections not closed for reconstruction during construction. With the exception of Lake Street, intersections will be fully closed for approximately ten days to allow for construction in and/or around the intersection. Travelers may cross at other locations during these intersection closures.